A voting method is just one (key) piece of a voting system: the complete, interconnected set of roles, tools, and processes that gather a group’s individual opinions and preferences and distill them into a single group decision. Voting methods can be implemented physically in many different ways. While voting methods are logical rules, they may lend themselves to various physical implementations that differ in criteria like simplicity or security. Allocative voting methods are the oldest, going back at least 2000 years. 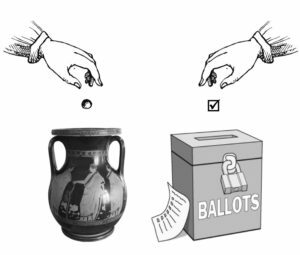 The word “psephology” (election science) comes from the Greek word for “pebble”, “ostracize” from the Greek word for “pottery shard”, and “ballot” from the Italian word for “little ball”—all of these voting tokens could be dropped in a candidate’s urn. The phrase “to cast one’s vote for a candidate” (shortened to “to vote for”) assumes an allocative method, where the voters give their vote tokens to a candidate. You can read more about the etymology and history of voting from Oxford. Allocative methods include the common choose-one Plurality Voting, Top Two with Runoff, and Cumulative Voting, as well as the newer Asset Voting, Liquid Democracy, PLACE, and E Pluribus Hugo. Allocative voting methods are simple, but inherently vulnerable to vote splitting. For that reason, a key trait of allocative methods is their reallocation rule, if no candidate (or not enough candidates, in multi-winner elections) has reached the threshold to win. Reallocation can be determined by the voters or the candidates, according to preferences expressed before or after initial balloting. For example, PLACE Voting has candidates declare their “heirs” before the election, while Asset Voting allows them to negotiate after the initial tallying. TTRO has a second round of voting. Choose-one Plurality Voting has no threshold (though it is also, inexplicably, called First Past the Post), and thus no reallocation rule. Comparative voting methods became known just over 200 years ago, at the peak of the Enlightenment. Having voters rank their candidates was an obvious balloting improvement, but how to tally them was less obvious, and highly problematic. The simplest way (convert the rankings to summable points) turned out to be deeply flawed, and the better ways were still flawed, as well as complex. In 1972 Kenneth Arrow was awarded the Nobel Memorial Prize in Economic Sciences for his Impossibility Theorem showing that no comparative voting method could simultaneously satisfy several reasonable criteria. Ranked voting methods’ problems, paradoxes, and complexities have prevented them from being widely adopted. Evaluative voting methods are the newest, arising over 20 years ago, in the wake of mass surveys, and later the Internet. People became accustomed to rating everything on Likert scales (strongly like, like, neutral, dislike, strongly dislike) or simple binary like-or-not scales. Such scales can also be used for voting, with two huge advantages: they sum easily, and they don’t split. Evaluative methods can be divided further into two categories: scored and graded. 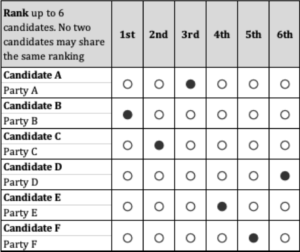 Scored methods use a numeric scale, and each candidate’s scores are summed. 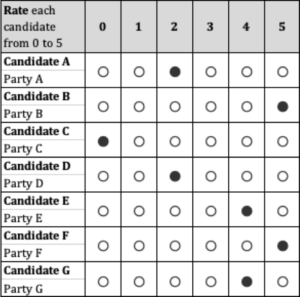 Graded methods use a scale with named grades, and each candidate’s grades are counted. More complex variants exist. Another name for evaluative voting methods is Range Voting, which you can read about at The Center for Range Voting. Honeybees use an interesting evaluative voting method when choosing a new home. Scouts head out, find candidate nesting sites, return home, and “waggle dance” to show the location and quality of a candidate. The length of the dance corresponds to the bee’s assessment of the candidate’s quality. 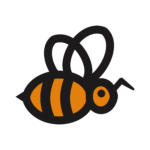 The longer the bee dances, the greater the chance that other bees will notice, go check out the site for themselves, and return home to share their opinion. Not all bees serve as scouts, and no bee checks out every candidate site—the swarm has to economize on time and energy. However, enough bees do participate, and eventually they reach a consensus, whereupon they up and move. In a fascinating case of engineering agreeing with evolution, a similar voting method was developed by voting theorist Jameson Quinn for the Webby Awards. This entry was posted in honeybees, vote splitting, voting methods and tagged honeybees, vote splitting, voting methods. Bookmark the permalink.